Over the last three months, the Euro has appreciated 10% against the Dollar and by smaller margins against a handful of other currencies. Over the last twelve months, that figure is closer to 20%. That’s in spite of anemic Eurozone GDP growth, serious fiscal issues, the increasing likelihood of one or more sovereign debt defaults, and a current account deficit to boot. In short, I think it might be time to short the Euro. There’s very little mystery as to why the Euro is appreciating. In two words: interest rates. Last week, the European Central Bank (ECB) became the first G4 Central Bank to hike its benchmark interest rate. Moreover, it’s expected to raise rates by an additional 100 basis points over the next twelve months. Given that the Bank of England, Bank of Japan, and US Federal Reserve Bank have yet to unwind their respective quantitative easing programs, it’s no wonder that futures markets have priced in a healthy interest rate advantage into the Euro well into 2012. From where I’m sitting, the ECB rate hike was fundamentally illogical, and perhaps even counterproductive. Granted, the ECB was created to ensure price stability, and its mandate is less nuanced than its counterparts, which are charged also with facilitating employment and GDP growth. Even from this perspective, however, it looks like the ECB jumped the gun. Inflation in the EU is a moderate 2.7%, which is among the lowest in the world. Other Central Banks have taken note of rising inflation, but only the ECB feels compelled enough to preemptively address it. 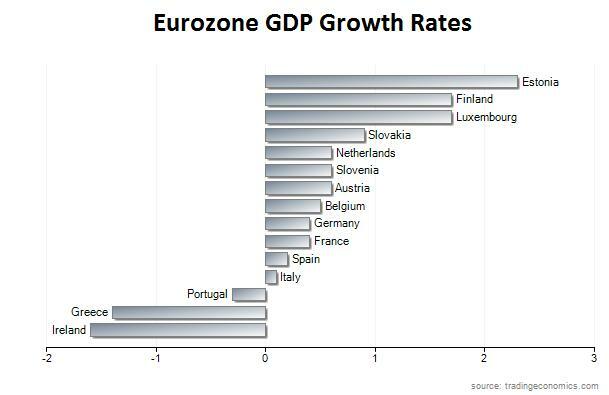 In addition, GDP growth is a paltry .3% across the EU, and is in fact negative in Greece, Ireland, and Portugal. As if the rate hike wasn’t bad enough, all three countries must contend with a hike in their already stratospheric borrowing costs, ironically making default more likely. Talk about not seeing the forest for the trees! If the rumors are true, Portugal will soon become the third country to receive a bailout from the EU. (It should be noted that as recently as November, Portugal insisted that it was just fine and that a bailout wasn’t necessary). Its sovereign credit rating is now three notches above junk status. Today, Greece became the first Eurozone country to be awarded this dubious distinction, and Ireland is now only one downgrade away from suffering the same fate. Of course, Spain insists that it is just fine and denies the possibility of a bailout. At this point, though, does it have any credibility? Based on rising credit default swap rates (which serve as a gauge of the probability of default), I think that investors have become a little more cynical about taking governments at face value. I have discussed the fiscal woes of the Eurozone in previous posts, and don’t want to dwell on them here. For now, I’d only like to add a footnote on the extent to which their problems are intertwined. Banks in Germany and France (as well as the rest of the EU) have tremendous balance sheet exposure to PIGS’ sovereign debt, which means that any default would multiply across the Eurozone in the form of bank failures. (You can see from the chart below that the exposure of the US is small, relative to GDP). Some analysts insist that all of this has already been priced into the Euro. Citigroup Said, “The market is treating many of these [sovereign credit rating] downgrades as rearguard actions which are already well discounted.” Personally, I don’t think that forex markets have made a sincere effort to grapple with the possibility of default, which appears increasingly inevitable. In fact, when S&P issued a warning on the US AAA rating, traders responded by handing the Euro its worst intraday decline in 2011. Any way you cut it, I think the Euro is overvalued. Regardless of what the ECB is doing, market interest rates don’t really confer much benefit to those holding Euros. Even if the rate differential widens to 1-2% over the next year (which is certainly not guaranteed, as Jean-Claude Trichet himself has conceded!) 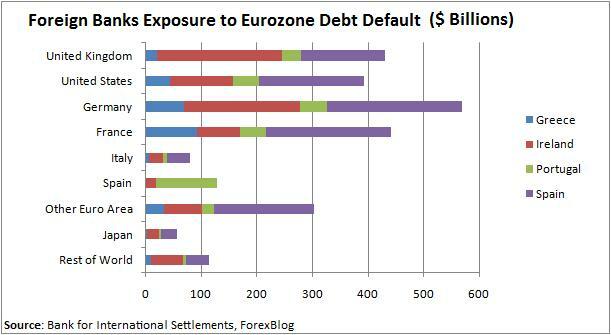 this isn’t really enough to compensate for the possibility of default or other risk event. Regardless of whether you want to be long or short risk, there isn’t much to be gained at the moment from holding the Euro. if we look at EUR/USD we know that euro still strugling especially yunani which has a problem with thir country. but the most important are Germany that bring big effect for currency mover of euro toward usd. at this time, the euro grow up time by time. I still don’t understand the hawkishness of ECB, Inflation in UK is about the double and yet BOE does nothing, I don’t know much about monetary policy but I think this is crazy. I agree with you on the Euro at the moment, it is definitely not a risk free investment at this time. Good article. The EU doesn’t have anywhere near the debt the US does. Weidmer and other economists have pointed to the dollar index decline down to around 25 and suggested investing long term in the Euro as a safe haven. By the way, we shouldn’t uppercase any currency. It’s euro and eurozone. That may be part of the overvaluation. « Is the Kiwi the Most Overvalued Currency?